It was in the summer of 1915 that my friend, the Rev. D.H.S. Cranage of Cambridge, wrote and told me that a friend of his, a Mr. A. E. Clarke, had had in his possession, at one time, a heavy gold ring bearing the Arms of the Hubbard family. Dr. Cranage urged me to buy the ring: but at first I was not disposed to do so, feeling as I did, that my particular branch of the Hubbard race could not prove any title to them. Subsequently I considered that the ring might be worth buying and I therefore wrote to Dr. Cranage to that effect and he kindly forwarded my letter to Mr. Clarke. As will appear from the correspondence, a miller and a small farmer at West Walton, Norfolk, after harrowing a field found the ring on one of the tines of his harrow. Mr. Clarke bought the ring from the miller and sold it, together with a letter from Sir John Evans, to a Mr. Welldon of Wellingbourgh. At Mr. Welldon's death it was again sold with two other rings by Frank Knight & Rutley, Auctioneers, on July 24th 1914. A certain Mr. Joseph Brooks bought the three rings in one lot at the Auction, and I subsequently bought the same three rings from Mr. Brookes. After this short account the correspondence will be more clearly understood. Our friend Dr. Cranage has shown me your letter. I should be extremely sorry if we missed two of the rings, one I believe is quite modern. I wonder if you would kindly undertake the purchase of the three, keeping the one you want (and you ought to have) and sending me the other two. I am enclosing a sort of order to Brooks to deliver the rings to you also his offer of them to me, if I pay in advance! (which I am not disposed to do) or to my London Agent. If we bought the rings for £18, I should be pleased that you should have the Hubbard ring for £16, which I think is a fair valuation. I do not clearly remember the other two but I should like to have them as they belonged to a very old friend of mine. They have no history, but I am able to add to the value of the large ring by information no one else possesses and I have had much trouble and expense in keeping in touch with it. In answer to your letter of 23rd / 6 /1915 the two rings are still for sale price £16. 0. 0. for the two old ones or £18. 0. 0. for the 3. They are the same rings I bought at Knight, Frank & Rutely on July 24 1914 Lot 31. They have not been out of my possession since I cleared them. I cannot sent you a wax impression of them. You are a stranger to me, and if you mean business, you can send me the cash for them and I will send them to you by Register Post or I will deliverer them to your London Agent on Payment of Cash. If these terms do not suit you, please do not write again about them. From the tone of Mr. Brook’s letter to Mr. Clarke, I did not feel that this document was likely to be of much service to me. Money was what Mr. Brooks wanted and so long as he secured that, I felt certain that he would he disposed to dispense with introductory formalities. I took an early opportunity of motoring over from Eltham to Bromley and after some little difficulty I found 10 Cambridge Road. It was a very humble dwelling and though I knocked and rang there was a suspicious stillness in the house. Obviously no one was at home. A second visit on October 3rd 1915 was more successful. A gaunt slatternly woman opened the door. Mr Brooks was at home and the woman showed me into a tiny sitting room where I was left to await the arrival of Mr. Joseph Brooks. When he appeared I told him I had heard from Mr. Clarke and that I had come over to see the rings, about which Mr. Clarke had written to him. I have received your letter and the two rings and enclose with my best thanks £2. It was most kind of you to undertake the business I am afraid that it could not have been very pleasant. I am glad that you have got the Hubbard ring. It was found in 1892 and when my friend took it I felt sure he had the letter of Sir John Evans. The ring was found by a miller and small farmer at West Walton, Norfolk, after harrowing a field he found it on one of the tines of his harrow. I sent a report of the circumstances to Sir John Evans and then an impression of the seal and I enclose his two letters in reply to mine. 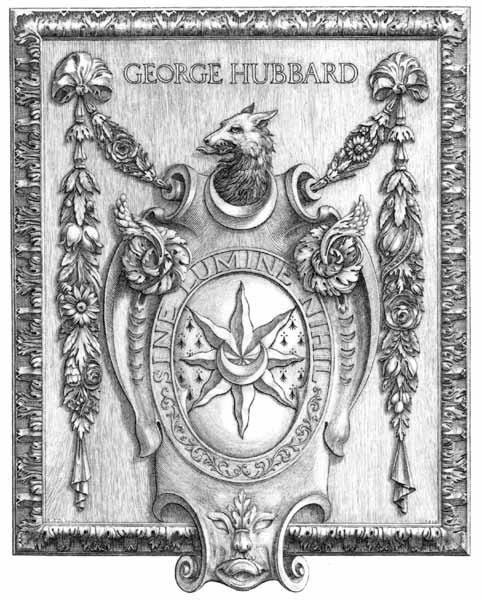 As far as I remember he said at once this is the Hubbard or Hobart Coat of Arms. The ring was of a very exceptional weight and it would be of the date he had mentioned or early in the next Century. I remember he mentioned the 3 Pellets between the points of the Star or Estoile. I do not remember anything else to tell you but if you will question me I will try to give an answer. So one evening in Autumn, I think of 1892, I was not surprised to have visit from a man from West Walton saying there had been a great find in a field a large armlet weighing (1 lb.) one pound of pure gold! This naturally excited me and I promised to go at once, but I believe the finder called the next day and showed it to me. I offered him £5. for it but he said he had already been offered £10. for it and so ultimately I bought it for £10. 10. 0. or perhaps £11. I reported the ring to Sir John Evans as I had just read one of his articles on Finger Rings and he encouraged me to buy it, after I had done so I told him and he asked me to show it to him. I therefore sent it and had a nice letter with full description. I have been for nearly forty years a collector of old English Pottery and have many times had to give up a treasure of this sort when I wanted to be extravagant on something for my collection. Some years ago my old friend Mr. Welldon of Wellingbourgh asked me to let him have the ring and he gave me £12. or £12. 10. 0. for it. It had only been in his possession and mine since it was found. At his death it was sold as you know by Frank Knight & Rutely in London with two other rings for £16. 0. 0. I cannot remember the name of the miller who found it but the circumstances of its having been found on the tine show that after he had shaken his harrow free from rubbish and dropped it again one tine hit it in the centre of the ring and fitted so exactly it had to be knocked off. There are still several members of a family of Hubbard living in the village and within a short distance a most respectable yeoman family. All fine tall men. I do not know if you claim this as a family characteristic! These things happened 23 years ago but I will go over and find the man's name and try and find him if you like. I think someone else must have mentioned the 3 pellets to me, because someone called the estoile a mullet which it certainly is not and the pellets are clearly ermine I now see. I will if you like send you Knight's Catalogue in which your ring occurs. I am obliged to you for your letter and am glad that you are pleased with my lecture on Posy Rings. Without seeing the ring that you mention it is hard to pronounce as to its date. It looks to me as if it belonged to the end of the 15th Century. I hope that you may be able to secure it. It is rarely that the weight is so great"
The ring weighs just over 1 oz. and I think it is 22 caret gold. The late Gothic design of the cusping of the shield is undoubtedly indicative of the end of the 15th Century. The other letter is written two days later. I congratulate you on the acquisition of the ring which is to judge from the impression is of about the end of the 15th Century. If you care for a fuller opinion upon it please send it for my inspection at your convenience. In Mr Clarke's letter to me of October 6th 1915, he refers to another letter from Sir John Evans; but unfortunately this letter appears to have been given by Mr. Clarke to Mr. Welldon when he sold the ring to him, and it is, I presume, no longer in existence. 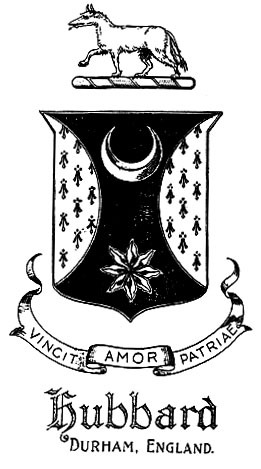 My friend Mr George H. Viner took much interest in the ring and gave me much assistance when I went to Herald's College with the object of adopting, if possible, the Coat of Arms on the ring. In a letter of October 4th 1915, he says it transpires from Papworth that "the Arms on the ring are those of Hobart as well as Hubbard." Thus Hobart (Baronetcy 1611 Barony 1728) Earl of Buckingham 1746 had "Sa an eight-pointed estoile or between two flauches erm" as did the Hobarts of Suffolk and of Dromon Co. Waterford. The estoile of the Hibbards was six pointed, but otherwise the coat was the same. The general effect of the two shields, when uncoloured is approximately the same. Sable, an estoile of eight points between two flaunches ermine. Sable, in chief a crescent argent and in base an estoile of eight points or between two flaunches ermine. Per saltire azure and ermine over all an estoille of eight points charged with a crescent Gules. If the crescent for the difference is added to the Arms of the Hobarts of Norfolk then, apart from the colour, the Arms are almost identical with the Hubbards of Co. Durham. The Chief difference between mine and those of the Hubbards of Co. Durham, apart from colour, is in the position of the crescent. 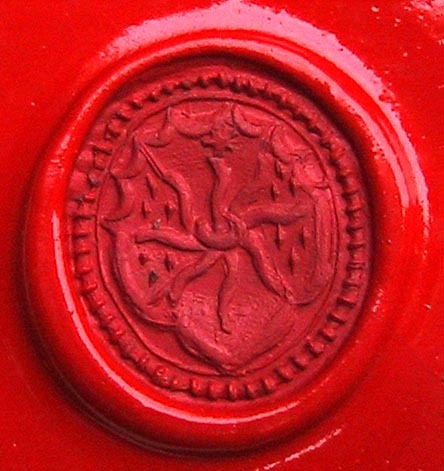 The wax impression in the cover is of the old late 15th Century Hubbard ring, and the Arms of the Hobarts of Norfolk, and the Arms of the Hubbards of Co. Durham and my own are given for the purpose of comparison. In my composition of the design for my Book Plate, I have embodied the Coat of Arms as granted at Herald's College, and for the rest of the design introduced a direct Grinling Gibbons character. In another volume I have written a full account of the history of the Gibbons Carving and Panelling which was so wrongly discarded from the Chapel of Winchester College, but as it was this carving which has played such an important part in my life and fortune, I am glad that it should be introduced into my book plate. Further notes by Nicolas George HUBBARD in 2003.